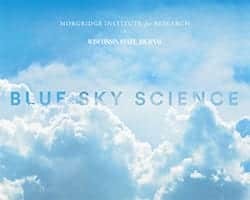 News & Stories > Blue Sky Science > Is the biofuel process a complete cycle? In photosynthesis, energy comes from the sunlight, but the matter, the weight of the plant material, comes mostly from carbon dioxide in the atmosphere. The biofuel process begins by taking carbon from the atmosphere and locking it into the organic plant material. Next, scientists take steps to turn the solid plant material into a liquid. The material is broken down into sugars, and the sugars are used through fermentation to make different types of fuel, including ethanol. Fuel, usually composed of about 10 percent ethanol in the United States, is used in cars and undergoes the process of combustion. Combustion produces carbon dioxide. This puts carbon dioxide back into the atmosphere where it was first taken, back at the beginning of the cycle. Scientists are working to make the process more efficient and to reduce carbon dioxide emissions. While plants use some carbon dioxide for food, rising levels of carbon dioxide in the atmosphere are accompanied by a warming climate. The biofuel industry today largely relies on corn grain to produce the ethanol. There are some issues and concerns with using a food material to make a fuel. As the population on this planet grows, it’s important to be responsible with what is done with food material. Research at UW-Madison is looking at using fibrous plant material, leaves and stems instead of grains, to make biofuel. While using fibrous plant materials can be a little more complicated, it’s an opportunity to be much more efficient in terms of the energy and fertilizer required to make a biofuel. This can significantly reduce the amount of carbon put into the atmosphere and therefore try to minimize or even mitigate climate change.